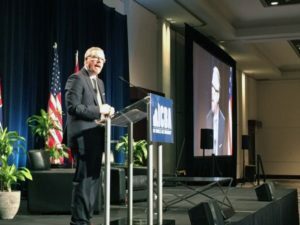 The following piece about ICBA’s 2018 Industry Outlook Forum first ran in the Journal of Commerce on May 23, 2018. The former premier of Saskatchewan is concerned Canada’s energy sector is being held back and left behind. 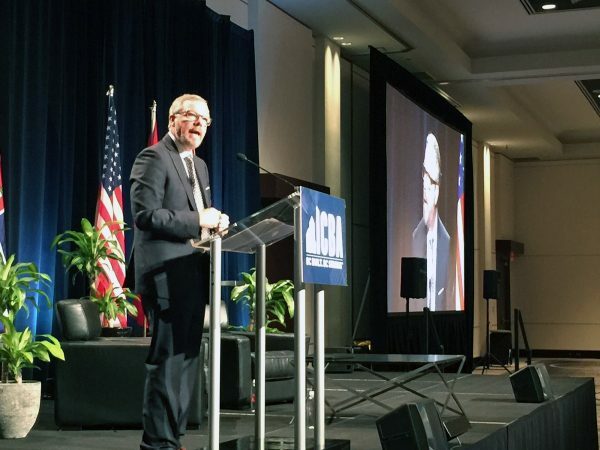 Brad Wall presented at the Independent Contractors and Businesses Association of British Columbia’s 2018 Industry Outlook on May 16 in downtown Vancouver. He spoke to the current state of Canada’s energy industry, which he said has until recently not been helped by government action at either the federal or provincial level. “In a time where federal and provincial governments should have followed the policy of ‘do no harm’ due to low energy prices, the government has done the opposite,” Wall said, citing B.C. Premier John Horgan’s opposition of the Trans Mountain pipeline project as well as the federal carbon tax. The federal government’s hewing to environmental protocols such as the Paris Agreement while the Donald Trump administration has walked away from the same restrictions will also affect Canada’s competitiveness, he said. “We’ve hard wired a carbon tax into our energy sector, and the U.S. has gone the opposite way,” he added. Wall was optimistic about a recent decision by the federal government to compensate Kinder Morgan or any other entity that will complete the Trans Mountain pipeline expansion despite opposition from British Columbia. “It’s an indication that the feds are prepared to act, and for those of us who want the pipeline built, we should acknowledge this is a priority for them,” Wall said. But the former premier expressed concern that while the government has shown it will act, there are other options available that don’t involve taxpayer money. “Before you take the fairly extreme position of using taxpayer dollars to mitigate the risks caused by the province of B.C. to this pipeline company, how about use other points of leverage like transfer payments or funding from the feds being withheld until that approval is granted,” he said. Wall said he respected and appreciated the wishes of British Columbians who want to protect their coast, but stressed the importance of completion of the project. “They care about the environment; we all do. But this is an expansion of an existing pipeline and it has gone through all the approval processes to address some of those concerns, so I’m surprised that it’s come to this, and this is really the only pipeline we’re left with,” he stated. In the absence of Canadian oil supply, he added, bad actors may fill the void. “Worldwide oil demand is forecast to grow significantly over the next number of years, and if Canada isn’t supplying it to the world because we can’t get it to market, Saudi Arabia will, Nigeria will, Venezuela will, and I promise you they care less about the environment than Canada does, and have a checkered history regarding the rule of law and human rights,” Wall claimed. But he said several factors could decide the fate of the Canadian energy sector in the near future, including upcoming elections in Ontario and Alberta, the possible resolution of the Trans Mountain issue, equalization payments this year and in 2019, and a federal election in 18 months. Wall also said in order for the federal government to back down on carbon taxes, there are two options. “There are two sources for relief: the courts, and the other, a sure remedy, is a federal election,” Wall said.